2016 turned out to be a disappointing year in terms of the amount of new drug approvals, especially compared to the totals from preceding years. The U.S. Food and Drug Administration approved for marketing 22 new molecular entities during last year, the lowest amount since 2010 and down by more than half of the 2015 total of 45, which represented a 19-year high. One reason for the downswing is five new drugs that had initially been slated for marketing clearance during 2016 wound up gaining U.S. regulatory clearance at the end of 2015. Additionally, there was a decrease in medicines that were submitted for approval and the FDA rejected or delayed more applications in 2016 than during the prior two years. Some of those delayed products may gain marketing clearance during 2017, including some exciting and innovative new medicines that are detailed in the pages that follow. The industry vibe remains mostly positive for R&D of new medicines, particularly in the areas of oncology and genetic diseases, though many drug firms continue to struggle taking a new chemical entity from the lab all the way through to marketing approval at tremendously high costs, along with resistance from health insurers and politicians regarding their lofty drug prices. President Trump certainly has made it no secret that he will do his best to bring down medicine prices. Deloitte data shows that R&D returns on investment at the top 12 pharma companies dropped to 3.7 percent in 2016 compared to a record 10.1 percent during 2010. According to a report issued by the Personalized Medicine Coalition (PMC), in 2016 – for the third year in a row – personalized medicines represented more than 20 percent of the new molecular entities to gain the green light from the FDA. PMC President Edward Abrahams noted that the trend reflects the pharma industry’s dedication to investing in personalized medicine despite the absence of a business model that ensures success and persistent barriers in public policy that slow the transition from a one-size-fits-all world to one that is based on delivering the right medicine to the right patient at the right time. Per the report, six personalized medicines were cleared for marketing by FDA during 2016 and nearly one of every four drugs the regulatory agency approved from 2014 to 2016 was a personalized medicine. In comparison, personalized medicines accounted for 5 percent of NME approvals during 2005. Data from the Tufts Center for the Study of Drug Development indicate that personalized medicines represent more than 40 percent of all drugs in clinical development. The 10 companies profiled in this article were chosen based on various criteria such as existing pipeline projects and their sales and marketing potential, areas of therapeutic concentration, M&A activity and its research and development impact, and recent drug approval productivity. AbbVie is focusing on advancing its pipeline to drive long-term sustainable growth. One element of AbbVie’s mission and focus is to develop a consistent stream of innovative new medicines. To that end, the company intends to launch 20 new products or indications by 2020 that elevate the standard of care and address significant unmet needs. AbbVie ’s R&D areas of focus include immunology, oncology, neuroscience and virology. Veliparib is viewed as one of best sale-generating prospects in the industry pipeline. The investigational oral poly (adenosine diphosphate [ADP]–ribose) polymerase (PARP) inhibitor is being assessed in multiple tumor types. PARP is a naturally occurring enzyme in the body that repairs DNA damage in cells. While this repair is a useful process to maintain the integrity of healthy cells, the same process may additionally help repair DNA in cancer cells, allowing them to survive. Discovered and developed by AbbVie researchers, veliparib is being tested in combination with chemotherapy or radiation to help determine whether it can prevent DNA repair in cancer cells to possibly increase the effectiveness of common DNA-damaging therapies, including chemotherapy or radiation. The potential new chemical entity is being evaluated in more than a dozen cancers, including in Phase III trials in advanced squamous and non-squamous non-small cell lung cancer (NSCLC), ovarian cancer and breast cancer. The investigational medicine was granted orphan drug designation in November by U.S. regulators for treating advanced squamous NSCLC. During 2016, Venclexto (venetoclax) was regarded as one of the industry’s most promising pipeline products in terms of eventual sales potential. In December 20016, the European Commission granted conditional marketing authorization for Venclexto monotherapy for treating chronic lymphocytic leukemia (CLL) in the presence of 17p deletion or TP53 mutation in adult patients who are unsuitable for or have failed a B-cell receptor pathway inhibitor; and for the treatment of CLL in the absence of 17p deletion or TP53 mutation in adult patients who have failed chemoimmunotherapy and a B-cell receptor pathway inhibitor. The U.S. FDA granted accelerated approval of Venclexta in April 2016 for treating patients with CLL with 17p deletion who have received at least one prior therapy. The B-cell lymphoma 2 (Bcl-2) inhibitor has been projected to generate sales of more than $2 billion in 2022. Venclexta is being jointly developed by AbbVie and Genentech, a member of the Roche Group. AbbVie filed a new drug application to the U.S. FDA for its investigational, pan-genotypic, once-daily, ribavirin-free regimen of glecaprevir (ABT-493)/pibrentasvir (ABT-530) (G/P). The NDA was accepted with priority-review designation, as announced in early February 2017. The combo product is being studied for treating chronic hepatitis C virus (HCV). In Phase III trials, eight weeks of therapy with G/P achieved high sustained virologic response (SVR) rates across all major genotypes (GT 1-6) in patients without cirrhosis, which represents the majority of HCV patients. Abb­Vie received U.S. FDA breakthrough therapy designation for its investigational regimen for treating patients who failed previous therapy with DAAs in genotype 1. 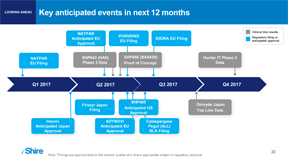 AbbVie additionally filed its EU regulatory application and remains on track for submission in Japan during first-quarter 2017. AbbVie managers expect commercialization of the next-generation combination during 2017. 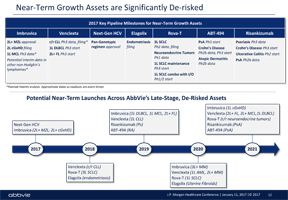 AbbVie’s glecaprevir/pibrentasvir (G/P) clinical development program was designed to explore a quicker path to virologic cure for all major HCV genotypes (GT1-6), with the goal of addressing treatment areas of continued unmet need. G/P is an investigational, pan-genotypic regimen being studied as a potential cure in 8 weeks for HCV patients without cirrhosis and who are new to treatment, who make up the majority of HCV patients. AbbVie is additionally testing G/P in patients with specific treatment challenges, including genotype 3, patients who were not cured with previous DAA treatment, and those with chronic kidney disease (CKD), such as patients on dialysis. G/P is an investigational, once-daily regimen that brings together two distinct antiviral agents in a fixed-dose combination of glecaprevir (300mg), an NS3/4A protease inhibitor, and pibrentasvir (120mg), an NS5A inhibitor. G/P is dosed once per day as three oral tablets. Glecaprevir (GLE) was discovered during the continuing collaboration between AbbVie and Enanta Pharmaceuticals for HCV protease inhibitors and regimens, including protease inhibitors. Unlike many industry players, AbbVie has not shied away from developing new medicines to tackle the difficult research area of neuroscience. In January 2017, Abbvie announced the beginning of two Phase II clinical study programs to explore ABBV-8E12, an investigational anti-tau antibody, in patients with early Alzheimer’s disease and progressive supranuclear palsy (PSP). In recognition of the lack of treatment options available to patients with PSP, FDA granted fast track designation to ABBV-8E12. The FDA and European Medicines Agency (EMA) also granted orphan drug designations to the new drug candidate for PSP. Licensed from C2N Diagnostics during 2015, the humanized antibody ABBV-8E12 is being evaluated to target the tau protein, which is believed to stabilize intracellular structures necessary for maintenance and transport in neurons. Abnormal accumulation of altered tau protein is a hallmark in various neurodegenerative conditions, where the development of tau pathology strongly correlates with clinical disease progression. AbbVie continues to expand its Imbruvica program. The U.S. Food and Drug Administration in January 2017 approved the product to treat patients with marginal zone lymphoma (MZL), an indolent form of non-Hodgkin’s lymphoma (NHL). There are no other approved treatments specifically indicated for patients with MZL. This approval marks the fifth unique type of blood cancer indication cleared for Imbruvica. The first-in-class, oral, once-daily therapy Imbruvica inhibits a protein called Bruton’s tyrosine kinase. BTK is a key signaling molecule in the B-cell receptor signaling complex that plays a significant role in the survival and spread of malignant B cells. The medicine blocks signals that inform malignant B cells to multiply and spread uncontrollably. Imbruvica is jointly developed and commercialized by Pharmacyclics, which is an AbbVie company, and Janssen Biotech. FDA granted orphan drug designation to risankizumab (ABBV-066; formerly BI 655066) for the investigational treatment of Crohn’s disease in pediatric patients, as reported by Abb­Vie in late November. Risankizumab is being studied in immunological disorders, including Crohn’s disease, psoriasis, psoriatic arthritis and asthma. The investigational treatment is part of a collaboration between Boehringer Ingelheim and AbbVie, with AbbVie leading future development and commercialization of risankizumab worldwide. The potential new medicine has not been approved for marketing by any regulatory health bodies. AbbVie and the Johns Hopkins University School of Medicine inked a five-year collaboration in December with the goal of advancing medical oncology research and discovery at the organizations. Designed to build strong collaboration between AbbVie and Johns Hopkins Medicine researchers, the deal will concentrate on several fields of oncology research and could include lung, colorectal, breast, prostate and hematological cancer. AbbVie and Northwestern University in December revealed a five-year collaboration with the goal of advancing oncology research and discovery. AbbVie and the university’s Robert H. Lurie Comprehensive Cancer Center are working in several areas of oncology research, which in addition to others could include lung, colorectal, breast, prostate and hematological cancer. AbbVie announced during fourth-quarter 2016 several new worldwide research collaborations with leading healthcare innovators to advance early-stage research in key therapeutic fields including oncology and immunology. These included a research and license deal with Pure MHC, a privately held target discovery company, to discover and validate peptide targets for use with T-cell receptor therapeutics in several forms of cancers; an exclusive license with Dong-A-ST, a leading specialty healthcare company in South Korea, for MerTK inhibitors in pre-clinical development for use in conjunction with immuno-oncology therapies; and a partnership with Zebra Biologics, a discovery-stage biotech company, to discover agonist antibody therapeutics for inflammatory diseases. 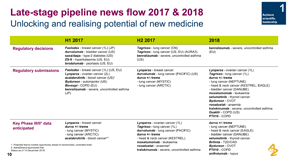 According to AstraZeneca, the company has “an exciting and balanced pipeline underpinned by great science.” AstraZeneca’s pipeline forms a robust portfolio of investigational therapies in various stages of clinical development. The company pipeline included 138 projects as of November 2016, including 10 new molecular entities in late-stage development. Leading the charge to reach the marketplace and generate blockbuster sales is the PD-L1 human monoclonal antibody (mAb) durvalumab. The U.S. Food and Drug Administration in December accepted the first biologics license application (BLA) for durvalumab and granted priority-review status. The Prescription Drug User Fee Act (PDUFA) for approval review is scheduled for second-quarter 2017. The BLA submission is for the treatment of patients with locally advanced or metastatic urothelial carcinoma (UC) whose disease has progressed during or after one standard platinum based regimen. The BLA filing is based on the results of the UC cohort of Study 1108 and follows the FDA’s February 2016 Breakthrough Therapy Designation for durvalumab. Durvalumab garnered fast-track designation in 2015 for treating patients withPD-L1 positive metastatic head and neck squamous cell carcinoma. An investigational human monoclonal antibody, durvalumab is directed against programmed death ligand-1 (PD-L1). PD-L1 expression allows tumors to evade detection from the immune system via binding to PD-1 on cytotoxic T lymphocytes. Durvalumab blocks PD-L1 interaction with PD-1 and CD80 on T cells, countering the tumor’s immune-evading tactics and activating the patient’s immune system to combat the cancer. As part of a broad development program, durvalumab is being evaluated as monotherapy and in combination with tremelimumab (CTLA-4 mAb) in the Phase III DANUBE study as first-line treatment for patients with metastatic UC, regardless of eligibility for cisplatin-based chemotherapy. That combination is additionally being tested in Phase III studies in non-small cell lung cancer, head and neck squamous cell carcinoma (HNSCC) and in Phase II and earlier trials in gastric cancer, pancreatic cancer, hepatocellular carcinoma (HCC) and blood cancers. AstraZeneca has more than 30 continuing durvalumab clinical studies in combination with other immuno-oncology (IO) agents and targeted therapies. Immuno-oncology is a therapeutic approach designed to stimulate the body’s immune system to eliminate tumors. At AstraZeneca and the company’s biologics R&D arm MedImmune, the IO portfolio is anchored by immunotherapies that have been designed to overcome anti-tumor immune suppression. Management believes that IO-based therapies will offer the potential for life-changing cancer treatments for the vast majority of patients. AstraZeneca is pursuing a comprehensive clinical trial program that includes durvalumab monotherapy and durvalumab in combination with tremelimumab (CTLA-4) in multiple tumor types, disease stages and lines of therapy using the PD-L1 biomarker as a decision-making tool to define the best potential treatment path for patients. The ability to combine AstraZeneca and MedImmune’s IO portfolio with small targeted molecules from across their oncology pipeline, and with those of their partners, may provide new treatment options across an extensive range of tumors. During January 2017, AstraZeneca provided an update on its IO late-stage clinical development program in first-line NSCLC, including a refinement of the Phase III MYSTIC study. MYSTIC was initially designed to study the benefit of durvalumab monotherapy as well as durvalumab and tremelimumab (durva + treme) combination therapy compared to standard-of-care (SoC) chemotherapy, concentrated on progression-free survival (PFS). MYSTIC now is evaluating PFS and overall survival (OS) endpoints in patients with PDL1-expressing tumors for durvalumab monotherapy and the combination of durva + treme, as well as in “all comers” for the combination of durva + treme, versus SoC chemotherapy. AstraZeneca anticipates MYSTIC PFS data during mid-2017 and final OS data at the latest in 2018. MYSTIC additionally includes several undisclosed interim analyses for OS. AstraZeneca and Eli Lilly have agreed on a global deal to jointly develop MEDI1814. The antibody selective for amyloid-beta 42 (Aβ42) is undergoing Phase I testing as a potential disease-modifying treatment for Alzheimer’s disease (AD). The December transaction builds on the existing collaboration related to AZD3293, a BACE inhibitor in two pivotal Phase III studies. The build-up of brain plaques containing the peptide amyloid-beta (Aβ) is a characteristic of AD. MEDI1814 binds selectively to Aβ42, a type of Aβ that is particularly associated with the disease. MEDI1814 dose-dependently reduces levels of this peptide, possibly slowing AD progression. Management says AstraZeneca and MedImmune are continuing the oncology momentum built during 2016. The company is reinforcing its leadership in lung and breast cancer research and growing late-stage pipeline of potential medicines for life-threatening blood cancers. Among new chemical entities, acalabrutinib represents a potential best-in-class investigational therapy for treating a range of B-cell malignancies. Acalabrutinib is an investigational, highly selective, potent Bruton tyrosine-kinase (BTK) inhibitor in Phase III pipeline development for B-cell malignancies. The Food and Drug Administration in October accepted a complete re-submission of a new drug application (NDA) for sodium zirconium cyclosilicate (ZS-9) by ZS Pharma, a wholly owned subsidiary of AstraZeneca. The FDA indicated that this is a complete class 2 response for the potential new medicine, intended for the treatment of hyperkalemia (high potassium level in the blood serum). Although Biogen’s total number of pipeline prospects does not quite weigh as heavily on the scale as that of some of the industry’s largest players, the company does strongly compete on a pound-for-pound basis. Biogen is carrying out numerous clinical studies in neurologic, hematologic, and immunologic diseases to assess the efficacy and safety of potential therapies. Biogen is tackling research in some tough-to-crack diseases, including Alzheimer’s disease, multiple sclerosis and spinal muscular atrophy. The company is at the forefront of neurology research for conditions such as Alzheimer’s disease, Parkinson’s disease and amyotrophic lateral sclerosis (ALS). Biogen introduced a new chemical entity, Spinraza (nusinersen), to the marketplace during 2016 and analysts are forecasting eventual billion-dollar sales on a yearly basis. Spinraza is being developed worldwide for the treatment of spinal muscular atrophy. Spinal muscle atrophy is characterized by loss of motor neurons in the spinal cord and lower brain stem, leading to severe and progressive muscular atrophy and weakness. Ultimately, individuals with the most severe type of spinal muscle atrophy can become paralyzed and have difficulty performing the basic functions of life, such as breathing and swallowing. An antisense oligonucleotide (ASO), Spinraza is designed to treat spinal muscle atrophy caused by mutations in the chromosome 5q that leads to SMN protein deficiency. The new medicine alters the splicing of SMN2 pre-mRNA in order to increase production of full-length SMN protein. ASOs are short synthetic strings of nucleotides that selectively bind to target RNA and regulate gene expression. Through this technology, Spinraza has the potential to increase the total of full-length SMN protein in spinal muscle atrophy patients. The product is administered through an intrathecal injection, which delivers therapies directly to the cerebrospinal fluid (CSF) around the spinal cord, where motor neurons degenerate in spinal muscle atrophy patients because of insufficient levels of SMN protein. FDA marketing clearance was granted via priority review during December 2016 for Spinraza, the first approved treatment for spinal muscular atrophy. In October, the European Medicines Agency (EMA) validated the company’s marketing authorization application (MAA), and the EMA’s Committee for Medicinal Products for Human Use (CHMP) granted accelerated assessment status. Biogen has filed regulatory submissions in Japan, Canada and Australia and intends to initiate other country filings during 2017. Biogen licensed the worldwide rights to develop, manufacture and commercialize Spinraza from Ionis Pharmaceuticals, which is a leader in antisense therapeutics. The two companies performed an innovative clinical development program that moved Spinraza from its first dose in humans in 2011 to its first regulatory approval during 2016. Biogen presented new data during January 2017 from the Phase III ENDEAR trial, which showed a statistically significant reduction in the risk of death or permanent ventilation in Spinraza-treated infants with SMA compared to untreated infants. Two months earlier, Biogen and Ionis Pharmaceuticals announced that Spinraza met the primary endpoint at the interim analysis of CHERISH, a Phase III trial assessing the drug in later-onset (consistent with Type 2) SMA. The analysis found that children receiving Spinraza experienced a highly statistically significant improvement in motor function versus those who did not receive treatment. The new medicine additionally displayed a favorable benefit-risk profile in the clinical study. Biogen’s aducanumab is being tested in two worldwide Phase III trials, ENGAGE and EMERGE. The two studies are designed to assess the drug compound’s safety and efficacy in slowing cognitive impairment and the progression of disability in people with early Alzheimer’s disease. A human recombinant monoclonal antibody (mAb), aducanumab is derived from a de-identified library of B cells collected from healthy elderly subjects with no signs of cognitive impairment or cognitively impaired elderly subjects with unusually slow cognitive decline using Neurimmune’s technology platform called Reverse Translational Medicine (RTM). Biogen licensed aducanumab from Neurimmune through a collaborative development and license deal. Aducanumab is believed to target aggregated forms of beta amyloid including soluble oligomers and insoluble fibrils that can form into amyloid plaque in the brain of AD patients. Based on pre-clinical and Phase Ib data, treatment with aducanumab has been demonstrated to reduce amyloid plaque levels. During August 2016, aducanumab was accepted into the EMA’s PRIME program. During the following month, the FDA accepted aducanumab – also known by the product code BIIB037 – into its Fast Track program. Industry analysts have high hopes for aducanumab, which has been rated by EvaluatePharma as one of the top 20 most valuable R&D projects per an August 2016 report. The new drug candidate ranked No. 8 in that report with a net present value of $6.89 billion. Siemens Healthineers and Biogen are jointly developing magnetic resonance imaging (MRI) applications with the intent of quantifying key markers of multiple sclerosis (MS) disease activity and progression, per a deal struck in January 2017. 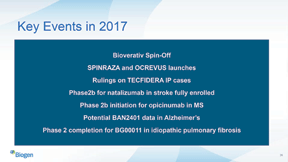 Other key pipeline events for Biogen during 2017 include full enrollment of Phase IIb for natalizumab in stroke; Phase IIb initiation for opicinumab in MS; potential BAN2401 data in Alzheimer’s; and Phase II completion for BG00011 in idiopathic pulmonary fibrosis. Natalizumab targets key mediators of post-ischemic inflammation and neurotoxicity. In a Phase II ACTION trial, natalizumab did not reduce MRI-defined infarct volume, but demonstrated benefit on key clinical measures up to 9 hours after onset. A second dose-ranging Phase II trial (ACTION 2) with an extended time window is scheduled to be fully enrolled during 2017. Opicinumab (anti-LINGO-1) is an investigational, fully human monoclonal antibody being developed as a potential neuroreparative therapy for individuals with relapsing forms of multiple sclerosis (RMS). Two Phase II studies (RENEW and SYNERGY) were designed to test the biological activity and clinical potential of opicinumab in CNS demyelinating diseases. According to its executives, leading-edge scientific research in oncology remains Celgene’s passion. The company is concentrated on developing disruptive approaches to high-value disease pathways that translate into life-enhancing medicines with the ultimate goal to change the course of human health while promising to always put patients first. Celgene has developed target-identification and drug-discovery technology platforms that allow the company to rapidly proceed from target identification and validation through lead identification and optimization. Celgene’s full-year 2016 R&D expenditure totaled $4.47 billion compared to $3.7 billion during 2015. The Phase III product candidate ozanimod is considered by various health analysts as one of the industry’s most valuable R&D projects. The novel, oral, selective sphingosine 1-phosphate 1 and 5 receptor modulator is undergoing development for immune-inflammatory indications including inflammatory bowel disease and relapsing multiple sclerosis. Treatment with S1P receptor modulators is thought to work by interfering with S1P signaling and preventing a certain subtype (ccr7+) of lymphocytes (a type of white blood cell) from exiting the lymph nodes and contributing to tissue inflammation. TOUCHSTONE is a Phase II, randomized, double-blind, placebo-controlled study comparing the efficacy and safety of ozanimod (additionally known as RPC1063) with placebo in patients with moderate to severe active ulcerative colitis. TOUCHSTONE met its primary endpoint and secondary endpoints with statistical significance for patients on the 1-milligram dosage of ozanimod compared to placebo. The phase III TRUE NORTH registration trial with ozanimod in patients with ulcerative colitis is enrolling with data expected during 2018. Data from a proof of concept phase II study of ozanimod in patients with Crohn’s disease are anticipated during 2017. Celgene is anticipating making important progress with various operational milestones during 2017. In the hematology/oncology area, FDA approval is expected for enasidenib (AG-221) as a treatment for patients with relapsed and/or refractory acute myeloid leukemia (AML) with isocitrate dehydrogenase-2 (IDH2) mutation. Enrollment is expected to begin in a pivotal program with JCAR017 in relapsed and/or refractory non-Hodgkin’s lymphoma in collaboration with Juno Therapeutics. In the Inflammation and Immunology (I&I) category, the company is on track with the U.S. submission of an NDA for ozanimod in patients with multiple sclerosis and an FDA filing for a supplemental NDA for the Otezla once-daily formulation. The investigational drug JCAR017 during December 2016 was granted breakthrough therapy designation by U.S. regulators for treating patients with relapsed/refractory (r/r) aggressive large B-cell non-Hodgkin lymphoma, including diffuse large B-cell lymphoma (DLBCL), not otherwise specified (de novo or transformed from indolent lymphoma), Primary mediastinal B-cell lymphoma (PMBCL) or Grade 3B follicular lymphoma. Also, the EMA Committee for Medicinal Products for Human Use (CHMP) and Committee for Advanced Therapies (CAT) granted JCAR017 access to the priority medicines (PRIME) scheme for r/r DLBCL. 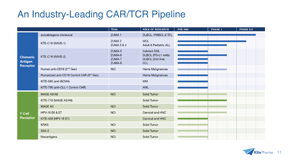 Celgene says JCAR017 uses a defined CD4:CD8 cell composition and 4-1BB as the costimulatory domain, which differentiates it from other CD19-directed CAR T product candidates undergoing clinical development. Juno Therapeutics is building a fully integrated biopharma company concentrated on re-engaging the body’s immune system to revolutionize oncology treatment. Plans are under way to initiate a pivotal U.S. study in patients with relapsed or refractory DLBCL during 2017. If approved for marketing, JCAR017 is expected to attain blockbuster sales status. Speaking of blockbusters, Otezla (apremilast) is the first in a new class of medicines approved for treating psoriasis and psoriatic arthritis, two diseases involving dysregulated immune system activity. The drug is an oral small-molecule inhibitor of phosphodiesterase 4 (PDE4) specific for cyclic adenosine monophosphate (cAMP). PDE4 inhibition results in increased intracellular cAMP levels which is thought to indirectly modulate the production of inflammatory mediators. As of December 2016, Otezla had been cleared for marketing in 37 countries, including the United States, Europe and Japan. Since FDA’s 2014 approval of Otezla, Celgene has continued to develop novel orally available small molecules that inhibit the production of multiple pro-inflammatory mediators. Those small molecules include interleukin-2 (IL-2), IL-12, interferon-gamma, TNF-alpha, leukotrienes and nitric oxide synthase. Celgene’s lead investigational product, GED-0301, is an oligonucleotide that targets the messenger RNA for Smad7. In patients with Crohn’s disease, abnormally high levels of Smad7 interfere with TGF-β1 anti-inflammatory pathways in the gut, resulting in increased inflammation. Also known as mongersen, GED-0301 is designed to work locally to reduce Smad7 levels with negligible systemic exposure. The drug candidate is undergoing Phase III clinical studies for Crohn’s disease and Phase II trials for ulcerative colitis. If its present development path proceeds on course, GED-301/mongersen could be generating $1+ billion in annual sales within five years. Celgene during January 2017 acquired Delinia Inc. in a move that expands its pipeline of potential next-generation medicines for treating patients with autoimmune disorders. Located in the biotech hub of Cambridge, Mass., Delinia is a privately held company developing novel therapeutics for autoimmune diseases. The acquisition expands Celgene’s inflammation and immunology pipeline as well as related second-generation programs. Delinia’s lead program is DEL106, an IL-2 mutein Fc fusion protein designed to preferentially upregulat regulatory T cells (Tregs): immune cells that are critical to maintaining natural self-tolerance and immune system homeostasis. Tregs are critically significant immune regulatory cells in the pathophysiology of cancer and autoimmune disease. Augmenting Tregs as a means of restoring immune system balance has the potential to benefit patients with various autoimmune diseases including systemic lupus erythematosus and rheumatoid arthritis. Also during January, Celgene reached an exclusive worldwide research collaboration with Anokion, a privately held biopharma company developing novel tolerance-inducing therapeutics for autoimmune diseases. Anokion is advancing the company’s antigen-specific immune tolerance platform to develop therapeutics for multiple autoimmune indications. As part of the strategic collaboration deal, Celgene obtained an equity interest in Anokion and the exclusive right to acquire the company at pre-specified option exercise points. Celgene acquired Acetylon Pharmaceuticals during December 2016. 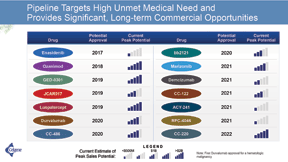 The deal includes global rights to Acetylon’s selective HDAC6 inhibitor programs and intellectual property in oncology, neurodegeneration, and autoimmune disease, including its lead drug candidates citarinostat (ACY-241) and ricolinostat (ACY-1215). In another December transaction, Celgene and Evotec struck a strategic drug discovery and development collaboration to identify disease-modifying therapeutics for a wide range of neurodegenerative diseases. Initial disease areas of concentration include amyotrophic lateral sclerosis, Alzheimer’s disease, Parkinson’s disease, and multiple other neurodegenerative disorders. Celgene during November 2016 acquired marizomib from privately held Triphase Accelerator. Marizomib is undergoing development for glioblastoma and relapsed and/refractory multiple myeloma. J&J’s Pharmaceuticals business is divided into five core categories, Cardiovascular & Metabolism; Immunology; Infectious Diseases & Vaccines; Neuroscience; and Oncology. J&J seeks innovation across all of these fields where there is significant unmet patient need. At least nine different pipeline projects are anticipated to be submitted for approval with U.S. and/or EU health regulators during the 2017-2019 period. The company’s product pipeline includes the potential blockbuster medicine and immunology product sirukumab. The human anti-interleukin (IL)-6 monoclonal antibody is being investigated for the treatment of adults with moderately to severely active rheumatoid arthritis. Data from the Janssen-sponsored head-to-head trial SIRROUND-H demonstrated that patients receiving sirukumab monotherapy showed significantly greater improvement in Disease Activity Score (DAS28), the first of two co-primary endpoints, versus Humira (adalimumab) monotherapy. AbbVie’s Humira is the top-selling prescription medicine worldwide for any therapeutic indication. Investigators additionally reported results from a second trial (SIRROUND-T), which demonstrated that patients refractory to or intolerant to one or more anti-tumor necrosis factor (TNF) treatments receiving sirukumab showed significant improvement in signs and symptoms of active RA versus placebo. The human monoclonal IgG1 kappa antibody targets the cytokine IL-6, a naturally occurring protein that is believed to play a role in autoimmune conditions such as RA. Sirukumab is being evaluated for approval by health authorities in the United States, Europe, and Japan as a SC therapy for treating adult patients with moderately to severely active RA. In addition to sirukumab, another potential billion-dollar yearly sales producer in the J&J pharma pipeline is the anti-cancer agent apalutamide (ARN-509). The drug compound is undergoing U.S. and EU Phase III development for prostate cancer pre-metastatic castration-resistant, metastatic hormone sensitive prostate cancer and localized prostate cancer indications. Apalutamide is also being developed in combination with the company’s Zytiga (abiraterone acetate) in U.S. and EU Phase III trials for a prostate cancer metastatic castration resistant chemotherapy naïve indication. J&J’s $30 billion acquisition of Actelion, announced near the end of January, brings Actelion’s complementary market-leading medicines and promising advanced late-stage therapies to Janssen Pharmaceuticals’ portfolio. The addition of Actelion’s specialty in-market medicines and late-stage products is consistent with J&J’s efforts to grow in attractive and complementary therapeutic fields and serve patients with serious illnesses and significant unmet medical need. In addition, the transaction structure will provide J&J flexibility to accelerate investment in its industry-leading, innovative pipeline to spur additional growth. J&J expects to leverage Actelion’s complementary capabilities in shaping medical paradigms. As part of the deal, immediately before the completion of the acquisition, Actelion will spin out its drug discovery operations and early-stage clinical development assets into a newly created Swiss biopharma company called R&D NewCo. J&J will receive an option on ACT-132577, a product within R&D NewCo that is undergoing phase 2 clinical development for resistant hypertension. The arrangements with R&D NewCo will provide J&J with further sources of innovation and value. J&J additionally will acquire worldwide rights to ponesimod, an S1P1 receptor modulator in Phase III development for multiple sclerosis, and cadazolid, a novel antibiotic in Phase III development for Clostridium difficile-associated diarrhea. Janssen Biotech entered a clinical trial collaboration with Bristol-Myers Squibb during January 2017 to study the combination of the first CD38-directed cytolytic antibody daratumumab and the checkpoint inhibitor nivolumab in Phase Ib/Phase II in multiple myeloma and several solid tumor types. Daratumumab is marketed by J&J as Darzalex, and nivolumab is commercialized as Opdivo by BMS. Janssen licensed daratumumab from Genmab and is responsible for all worldwide development, marketing and manufacturing. Darzalex is the first CD38-directed cytolytic antibody approved anywhere globally, with its first marketing clearance coming from FDA during November 2015 as a monotherapy for patients with multiple myeloma who have received at least three prior lines of therapy. The product was given the green light by FDA during November 2016 for use in combination with the immunomodulatory agent lenalidomide and dexamethasone, or the proteasome inhibitor bortezomib and dexamethasone, in patients with multiple myeloma who have received at least one prior therapy. Janssen Sciences Ireland UC revealed in December that two Phase III trials to test the safety and efficacy of switching virologically suppressed patients from a three or four drug (integrase inhibitor-, non-nucleoside reverse transcriptase inhibitor-, or boosted protease inhibitor-based) antiretroviral regimen to the two drug regimen of rilpivirine (Janssen) and dolutegravir (ViiV Healthcare) met the primary endpoint of non inferiority at week 48. Regulatory filings for the investigational two-drug regimen of rilpivirine and dolutegravir as a single tablet will be submitted during 2017. During November 2016, regulatory applications for approval were filed to the FDA and EMA for guselkumab as a treatment for adults living with moderate to severe plaque psoriasis. The human monoclonal antibody guselkumab has a novel mechanism of action that targets the protein interleukin (IL)-23. The new product candidate is undergoing Phase III development as a subcutaneously administered therapy for treating moderate to severe plaque psoriasis. In addition, a Phase III program is planned for the next-generation biologic in treating patients with active psoriatic arthritis. Janssen Research & Development during early February 2017 announced several new collaborations via its Janssen Human Microbiome Institute (JHMI) concentrated on advancing the discovery, development and commercialization of next-generation microbial products. The JHMI, in conjunction with the Janssen Disease Interception Accelerator (DIA), has initiated a collaboration with DayTwo Ltd. and the Weizmann Institute of Science to pursue microbiome-based health solutions targeting metabolic disorders. Also, with the scientific support of the JHMI and Bioqube Ventures, Caelus Health has become a portfolio company of Johnson & Johnson Innovation and one of the first to join the JLINX community in Beerse, Belgium, which nurtures early-stage companies by providing access to resources to grow and network across the European life science ecosystem. Caelus is advancing the clinical development of pharma products based on in-human insights for treating obesity-associated T2DM and cardio-metabolic complications. Janssen Pharmaceuticals in December accepted the prestigious International Prix Galien, recognizing excellence in scientific innovation to improve human health, for its Multi-Drug Resistant Tuberculosis (MDR-TB) treatment. The award is presented every two years to a medicine that has previously won a national Prix Galien, in recognition of the pharma industry’s outstanding achievement in developing new therapies. The International Prix Galien is regarded as the highest accolade for pharmaceutical R&D. This is the first time a treatment for a neglected disease such as tuberculosis was recognized by the Prix Galien. Though not possessing the pipeline depth of the other companies profiled in this article, Kite Pharma is developing an industry-leading pipeline of chimeric antigen receptor (CAR) and T cell receptor (TCR) engineered T cells. Based in Santa Monica, Calif., the clinical-stage biopharmaceutical company is engaged in the development of novel cancer immunotherapy products. Kite’s primary concentration is on engineered autologous cell therapy (eACT) designed to restore the immune system’s ability to recognize and eradicate tumors. Kite is enrolling four pivotal studies for KTE-C19, its most advanced product candidate and a potential blockbuster brand that could reach the marketplace during 2017. Also known as axicabtagene ciloleucel, KTE-C19 is an investigational therapy in which a patient’s T cells are engineered to express a chimeric antigen receptor to target the antigen CD19, a protein expressed on the cell surface of B-cell lymphomas and leukemias, and redirect the T cells to kill cancer cells. Kite announced in December 2016 that the company initiated the rolling submission to the U.S. FDA of the biologics license application (BLA) for axicabtagene ciloleucel as a treatment for patients with refractory aggressive non-Hodgkin lymphoma (NHL). Management anticipates the completion of the BLA submission by the end of first-quarter 2017 and launching the new medicine for NHL in 2017. The drug compound has been granted Breakthrough Therapy Designation status for diffuse large B-cell lymphoma (DLBCL), transformed follicular lymphoma (TFL), and primary mediastinal B-cell lymphoma (PMBCL) by the U.S. FDA and Priority Medicines (PRIME) regulatory support for DLBCL in the European Union. Kite is planning a regulatory submission to the European Medicines Agency during 2017. “We are making history with each step we take toward bringing engineered T-cell therapy to patients,” says Arie Belldegrun, M.D., FACS, Chairman, President, and CEO of Kite. During January 2017, Kite and Shanghai Fosun Pharmaceutical (Group) Co. Ltd. announced a joint venture, Fosun Pharma Kite Biotechnology Co. Ltd. The joint venture will develop, manufacture and commercialize axicabtagene ciloleucel in China with the option to include additional products, including two T cell receptor (TCR) product candidates from Kite. Fosun Pharma Kite will initially concentrate on axicabtagene ciloleucel. The joint venture has the option to license additional product candidates such as KITE-439, a TCR therapy directed against the human papillomavirus type 16 E7 oncoprotein and KITE-718, a TCR therapy directed against MAGE A3 and MAGE A6, antigens frequently found in solid tumors including bladder, esophageal, head and neck, lung and ovarian cancers. Opt-in and milestone payments for KITE-439 and KITE-718 could amount to $140 million plus profit sharing as well as mid-single digit sales royalties. Kite announced that characterizations of T cell receptor candidates which it has licensed under the Cooperative Research and Development Agreement (CRADA) with the National Institutes of Health (NIH) were published in the Dec. 8, 2016, New England Journal of Medicine (NEJM). The research – led by Steven A. Rosenberg, M.D., Ph.D., chief of the Surgery Branch at NCI’s Center for Cancer Research and a scientific collaborator with Kite – describes a patient with KRAS mutant metastatic colorectal cancer who was successfully treated with T cells that are reactive to KRAS G12D mutation. According to Kite, this work follows previously reported treatment of a patient with advanced cholangiocarcinoma with T cells targeting a mutated erbb2 interacting protein. As published in the NEJM publication, mutations in the KRAS gene are believed to drive 95 percent of all pancreatic cancers and 45 percent of all colorectal cancers. The G12D mutation is the most common KRAS mutation and is estimated to take place in more than 50,000 new cases of cancer in the United States annually. Kite announced during September 2016 that it had entered into an exclusive, worldwide license with the NIH for intellectual property related to multiple TCR-based product candidates for the treatment of tumors expressing mutated KRAS antigens. These TCR product candidates were developed in the laboratories of Dr. Rosenberg and James C. Yang, M.D., of the NCI. During the third quarter of 2016, Kite initiated patient enrollment in a Phase 1b/2 combination study of KTE-C19 and Genentech’s anti-PD-L1 monoclonal antibody atezolizumab. This represents the first combination trial of an anti-CD19 engineered CAR T-cell and a checkpoint inhibitor. At Kite’s investor day on Oct. 18, 2016, the company outlined KTE-C19 expansion studies with the potential to deliver six additional indications in B-cell malignancies. Also announced was the expansion of Kite’s TCR and CAR T development pipeline with four new INDs planned in the 2016-2018 timeframe. In addition, presented were “T cells 2.0” next-generation cell programming technologies to realize the full potential of engineered T-cell therapy. Novartis possesses one of the industry’s most respected development pipelines, with more than 200 projects in clinical development as of year-end 2016. 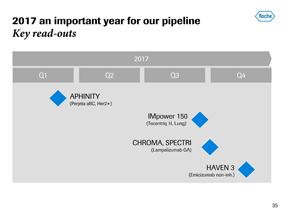 The company has 14 different pipeline projects expected to be filed for regulatory approval during 2017, including three new molecular entities: AMG334 for migraine, CTL019 for pediatric acute lymphoblastic leukemia, and RLX030 for acute heart failure. The fully human monoclonal antibody AMG334/erenumab is specifically designed to target and block the calcitonin gene-related peptide (CGRP) receptor, believed to have a critical role in mediating the incapacitating pain of migraine. Following the initial Phase II dose finding study in the prevention of episodic migraine, the efficacy of AMG 334 in migraine prevention has been demonstrated in a Phase II trial in chronic migraine and two Phase III studies in episodic migraine. AMG 334 is being evaluated in several large global, randomized, double-blind, placebo-controlled studies to assess its safety and efficacy in migraine prevention. AMG 334 is being jointly developed by Novartis and Amgen. The companies are pursuing discussions with regulatory agencies for potential approval submissions in respective territories. Amgen holds commercialization rights in the U.S., Canada, and Japan. Novartis maintains commercialization rights in Europe and the rest of the world. Novartis entered into a worldwide collaboration with Amgen during August 2015 to jointly develop and commercialize pioneering neuroscience treatments in the area of Alzheimer’s disease and migraine. The companies are partners in the development and commercialization of a beta-secretase 1 (BACE) inhibitor program in AD. Novartis’ oral therapy CNP520 – undergoing a Phase II trial for AD – is the lead molecule and further compounds from both companies’ pre-clinical BACE inhibitor programs may be considered as novel follow-on molecules. CNP520 has received FDA fast track designation. The collaboration additionally focuses on innovative investigational Amgen drugs in the migraine category, including AMG 334 (in Phase III studies for episodic migraine as well as open-label studies in episodic and chronic migraine) and AMG 301 (in a Phase I study). Novartis in December presented results from the first global registration study of CTL019 in pediatric and young adult patients with relapsed/refractory (r/r) pediatric and young adult patients with B-cell acute lymphoblastic leukemia (ALL). Eighty-two percent (41 of 50) of patients achieved complete remission or complete remission with incomplete blood count recovery in interim analysis of the Novartis trial called ELIANA. CTL019 is an investigational chimeric antigen receptor T cell (CAR T) therapy. Study enrollment has taken place across 25 centers in the United States, EU, Canada, Australia and Japan. The first global CAR T cell study, ELIANA will form the basis of a biologics licensing application to the FDA during early 2017. Novartis pivotal data from ELIANA is supported by the CTL019 U.S. multicenter study ENSIGN as well as an earlier single site trial in r/r pediatric and young adult patients with B-cell ALL. Novartis also intends to submit for approval with the European Medicines Agency (EMA) later in 2017. Industry analysts are abuzz over LEE011 (ribociclib) in combination with letrozole as first-line treatment for postmenopausal women with HR+/HER2- advanced or metastatic breast cancer. FDA has granted Priority Review to the new drug, and the EMA also has accepted for review the Novartis application for LEE011 plus letrozole in the same patient population. Analyses from the Phase III MONALEESA-2 trial demonstrated that LEE011 plus letrozole significantly prolonged progression-free survival across various pre-planned patient subgroups with HR+/HER2- advanced or metastatic breast cancer, including post-menopausal women diagnosed de novo, those with visceral metastases, and those with bone-only disease. Novartis is continuing to study LEE011 through the robust MONALEESA (Mammary ONcology Assessment of LEE011’s Efficacy and SAfety) clinical trial program, which includes MONALEESA-2, MONALEESA-3, and MONALEESA-7. These studies are assessing LEE011 in multiple endocrine therapy combinations across a wide range of patients, including men and premenopausal women. LEE011 (ribociclib) is a selective cyclin dependent kinase inhibitor, a class of drugs that aid in slowing the progression of cancer by inhibiting two proteins called cyclin dependent kinase 4 and 6 (CDK4/6). These proteins, when over-activated in a cell, can allow cancer cells to grow and divide too rapidly. Research shows that targeting CDK4/6 with enhanced precision may play a role in ensuring cancer cells do not grow uncontrollably. As of this magazine’s press time, LEE011 had not been approved for any indication in any market worldwide. LEE011 was developed by the Novartis Institutes for BioMedical Research (NIBR) via a research collaboration with Astex Pharmaceuticals. Novartis announced in November that FDA had granted priority review to PKC412 (midostaurin) for treating newly diagnosed FLT3 mutation-positive acute myeloid leukemia and advanced systemic mastocytosis. The Priority Review for the new drug application was based on data from the largest clinical studies ever performed for each indication. The EMA additionally has accepted the PKC412 (midostaurin) submission for review. With the AML treatment strategy having remained unchanged for more than 25 years, PKC412 may represent the first FLT3-mutated AML drug with a survival benefit. The investigational, oral, multi-targeted kinase inhibitor is intended for the treatment of patients with AML with a FLT3 mutation and for patients with advanced SM. PKC412 has not yet been approved for any indication worldwide. Additionally known as serelaxin, RLX030 is a recombinant form of human relaxin-2 hormone. Undergoing Phase III development for acute heart failure, the potential new product is administered via intravenous infusion. Novartis continues to make major strides in advancing its pipeline, in part through the execution of the company’s bolt-on M&A strategy. During early January 2017, Novartis entered into an exclusive option agreement with Ionis Pharmaceuticals and its affiliate Akcea Therapeutics to license two investigational treatments expected to significantly reduce cardiovascular risk in patients living with elevated levels of lipoprotein Lp(a) or ApoCIII, which is a potent regulator of triglycerides. The antisense therapies developed by Ionis – AKCEA-APO(a)-LRx and AKCEA-APOCIII-LRx – have the potential to lower lipoproteins up to 90% and significantly reduce cardiovascular risk in high-risk patient populations. The investment in biomarker-based therapies bolsters Novartis’ cardiovascular specialty pipeline and dedication to address unmet medical need of high-risk atherosclerosis/dyslipidemia patients. 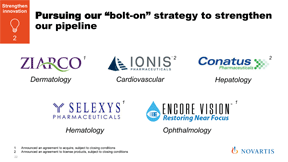 The acquisition of Encore Vision, as announced during December 2016, strengthens the ophthalmology pipeline of Novartis. Through the transaction, Novartis has added to its pipeline a first-in-class disease-modifying topical treatment for presbyopia patients in the field of high unmet medical need and high prevalence, known as EV06. Presbyopia is a common age-related loss of near distance vision characterized by a progressive inability to concentrate on nearby objects. Novartis additionally during December struck an option, collaboration and license deal with Conatus Pharmaceuticals to broaden the company’s liver portfolio to deliver best-in-class single and combination therapies for non-alcoholic steatohepatitis (NASH) with advanced fibrosis and cirrhosis. This transaction allows Novartis and Conatus to jointly develop emricasan. The investigational, first-in-class, oral, pan-caspase inhibitor is intended for treating non-alcoholic steatohepatitis (NASH) with advanced fibrosis (scarring) and cirrhosis. This collaboration has the potential to expand treatment options for people in different stages of fatty liver disease, where no approved medicines currently exist. Novartis has FXR agonists in clinical development for NASH, the most advanced of which is in a Phase 2 study and has been granted Fast Track designation from U.S. regulators. In another pipeline-bolstering move, Novartis in December acquired Ziarco Group, a privately held company concentrated on the development of novel dermatology treatments. With the acquisition comes to Novartis the once-daily oral H4 receptor antagonist ZPL389, which is being developed to treat atopic dermatitis, commonly known as eczema. ZPL389 demonstrated a clinically and statistically significant improvement of eczema lesions, resulting in a 50 percent reduction in EASI score versus placebo after eight weeks of treatment with a favorable safety profile. Selexys Pharmaceuticals, a company specializing in developing therapeutics in certain hematologic and inflammatory disorders, was purchased by Novartis during November. Novartis exercised its right to acquire Selexys following receipt of results of the SUSTAIN trial, a Phase II study assessing the use of the anti-P-selectin antibody SelG1 in the reduction of vaso-occlusive pain crises in patients with sickle cell disease (SCD). The acquisition complements and broadens Novartis’ hematology pipeline and underscores the company’s dedication to improving care for patients with high unmet need. Roche has more than 18,000 employees working on research and development to deliver medical innovations, a figure higher than the overall size of most pharma and biotech companies. The company recently launched four new medicines: Cotellic (advanced melanoma), Alecensa (lung cancer), Venclexta (chronic lymphocytic leukemia; jointly commercialized with AbbVie) and Tecentriq (bladder and lung cancer). Also, five FDA breakthrough therapy designations were granted for Roche medicines throughout 2016. One of Roche’s most important new products is the cancer immunotherapy Tecentriq (atezolizumab). During May 2016, Tecentriq became the first treatment to gain U.S. marketing clearance for individuals with previously treated advanced bladder cancer in more than 30 years. In January 2017, Roche announced that a second Priority Review had been granted for Tecentriq in advanced bladder cancer as a first-line treatment option for people not eligible for cisplatin chemotherapy. An FDA decision on the product’s marketing approval for the supplemental BLA is expected by April 30, 2017. A monoclonal antibody, Tecentriq is designed to target and bind to a protein called PD-L1 (programmed death-ligand 1), which is expressed on tumor cells and tumor-infiltrating immune cells. PD-L1 interacts with PD-1 and B7.1, both found on the surface of T cells, resulting in T-cell inhibition. By blocking this interaction, Tecentriq may enable T-cell activation, restoring the cells’ ability to effectively detect and attack tumor cells. The multiple sclerosis drug candidate Ocrevus (ocrelizumab) is anticipated to be one of the biggest product launches of 2017. The investigational, humanized monoclonal antibody is designed to selectively target CD20-positive B cells. That specific type of immune cell is believed to be a key contributor to myelin (nerve cell insulation and support) and axonal (nerve cell) damage, which can lead to disability in people with MS. Ocrevus binds to CD20 cell surface proteins expressed on certain B cells, but not on stem cells or plasma cells, and therefore significant functions of the immune system may be preserved. Ocrevus is the first investigational medicine to demonstrate superior efficacy versus comparators in relapsing and primary progressive multiple sclerosis in clinical trials. The product showed a favorable safety profile in three large Phase III trials. Ocrevus is the first investigational medicine to significantly reduce the progression of physical disability in primary progressive MS in a large Phase III study. Data from Phase III trials demonstrated consistent and clinically meaningful reductions in major markers of disease activity and progression compared with Rebif (interferon beta-1a) in RMS and with placebo in PPMS. Marketing applications for Ocrevus, filed for RMS and PPMS, have been validated and are under review by the European Medicines Agency (EMA) and U.S. Food and Drug Administration. The Prescription Drug User Fee Act (PDUFA) date for the approval review of the Biologics License Application (BLA) of Ocrevus is March 28, 2017. Assuming an FDA green light on this date, Ocrevus global sales are expected to top $4 billion by 2022 per industry analysts. Another anticipated future blockbuster emerging from the Roche pipeline is the investigational bispecific monoclonal antibody emicizumab. Also known by the product code ACE910, emicizumab is designed to bring together factors IXa and X. The two proteins are necessary to activate the natural coagulation cascade and restore the blood-clotting process. The drug compound can be administered by an injection of a ready-to-use solution under the skin (subcutaneously) once every week. Emicizumab is being studied in pivotal phase III trials in people 12 years of age and older, with and without inhibitors to factor VIII, and in children younger than 12 years old with factor VIII inhibitors. Future studies will seek to assess less frequent dosing schedules. The development program is evaluating emicizumab’s potential to help overcome current clinical challenges, including the short-lasting effects of existing treatments, the development of factor VIII inhibitors and the necessity for frequent venous access. Emicizumab was discovered by Chugai Pharmaceutical Co. Ltd. and is being jointly developed in conjunction with Roche by Chugai and Genentech. In December 2016, Roche reported that the potential hemophilia A treatment met its primary endpoint as well secondary ones in the first pivotal phase III trial, known as Haven 1. Emicizumab prophylaxis reduced the amount of bleeds over time versus no prophylaxis in people with hemophilia A and inhibitors to factor VIII. HAVEN 1 is a randomized, multicenter, open-label trial assessing the efficacy, safety, and pharmacokinetics of emicizumab. Roche presented other significant clinical results during 2016. A pivotal study in a group of people with hemophilia A (Haven 1) demonstrated that prophylaxis with emicizumab resulted in a significant reduction in the number of bleeds over time. A phase III trial by Roche company Chugai (J-Alex) found that first-line treatment with Alecensa significantly reduced the risk of disease worsening or death compared to crizotinib, the current standard of care, for individuals with ALK-positive NSCLC. Gazyva/Gazyvaro demonstrated positive results in a major clinical study (Gallium) in follicular lymphoma. Additionally in 2016, Roche presented data from the largest clinical study performed to date in giant cell arteritis (GCA), a serious inflammatory disease of blood vessels. Initially combined with a steroid regimen, Actemra/RoActemra more effectively sustained remission versus a steroid-only regimen in patients with newly diagnosed and relapsing GCA. 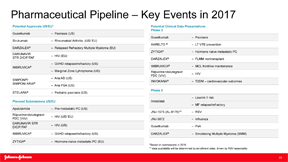 As of the beginning of February 2017, Sanofi’s R&D pipeline consisted of 44 pharmaceutical new molecular entities (excluding Life Cycle Management) and vaccine candidates in clinical development. Of that total, 13 were in Phase III or had been filed with regulatory authorities for marketing clearance. According to the company, more than 50 percent of projects stem from collaborations and partnerships. Within Sanofi’s R&D portfolio, industry analysts as a consensus are most excited about the dermatology drug Dupixent (dupilumab). The product is intended for the treatment of adults with moderate-to-severe atopic dermatitis (AD) who are candidates for systemic therapy. The investigational biologic therapy inhibits signaling of IL-4 and IL-13, two key cytokines necessary for the type 2 (including Th2) immune response, which is believed to be a major driver in the pathogenesis of the disease. A biologics license application (BLA) for Dupixent was accepted for Priority Review by the U.S. Food and Drug Administration during September 2016. Per the Prescription Drug User Fee Act (PDUFA), the target FDA action date is set for March 29, 2017. During December 2016, Sanofi and Regeneron Pharmaceuticals Inc. announced that the European Medicines Agency (EMA) had accepted for review the Marketing Authorization Application (MAA) for Dupixent. 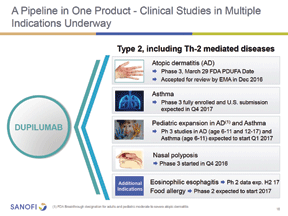 In addition to atopic dermatitis in adults, Dupixent is undergoing clinical studies in pediatric AD, asthma, nasal polyposis and eosinophilic esophagitis. If cleared for marketing, Dupixent would be commercialized by Regeneron and Sanofi Genzyme, the specialty care global business unit of Sanofi. According to recent EvaluatePharma analysis, Dupixent is forecasted to generate sales of $4.56 billion in 2022 based on its anticipated 2017 launch. “ … a key worry now is whether the manufacturing problems that recently delayed Sanofi/Regeneron’s rheumatoid arthritis project sarilumab might also hit Dupixent,” the analysts noted. Manufacturing deficiencies were raised by the FDA during a routine Current Good Manufacturing Practice (CGMP) inspection of a Sanofi manufacturing facility, which conducts “fill and finish” activities. Sanofi provided comprehensive responses to the U.S. regulatory agency for the cited deficiencies. Another Sanofi product expected to reach blockbuster sales is Soliqua (insulin glargine 100 units/mL & lixisenatide 33 mcg/mL injection). The new product gained FDA approval on Nov. 21, 2016, and was made available by prescription in U.S. pharmacies during early January. Soliqua 100/33 is indicated for treating adults with type 2 diabetes inadequately controlled on basal insulin (less than 60 units daily) or lixisenatide. Soliqua 100/33 joins together the company’s blockbuster diabetes brand Lantus and the GLP-1 receptor agonist lixisenatide. The once-a-day injection was studied in a Phase III program consisting of more than 1,900 patients. In an insulin intensification study, once-daily Soliqua 100/33 showed statistical superiority for the change in HbA1c from baseline to week 30 (p<0.0001) versus Lantus, the most prescribed basal insulin worldwide. Soliqua 100/33 is delivered via a single pre-filled SoloStar pen with a dose range spanning 15 to 60 units and two starting doses to support patients’ insulin needs. According to Sanofi, SoloStar technology is the most frequently used disposable insulin injection pen platform worldwide. The European Commission granted marketing authorization in Europe for Suliqua during January 2017 as a once-daily titratable fixed-ratio combination of basal insulin glargine 100 units/mL and GLP-1 receptor agonist lixisenatide for treating adults with type 2 diabetes. The marketing authorization is applicable to the 28 EU member states, Iceland, Liechtenstein and Norway. Launches in individual EU countries were expected from second-quarter 2017 onward. Another expected future blockbuster making its way into the marketplace during 2017 is the interleukin-6 (IL-6) receptor antibody Kevzara/Kevsara. On Feb. 1, 2017, Sanofi and Regeneron announced that Health Canada approved Kevsara (sarilumab) for the treatment of adult patients with moderately to severely active rheumatoid arthritis who have had an inadequate response or intolerance to one or more biologic or non-biologic disease-modifying anti-rheumatic drugs. A fully human monoclonal antibody, Kevsara binds specifically to soluble and membrane-bound IL-6 receptors, and has been demonstrated to inhibit IL-6-mediated signaling through these receptors. Local production of IL-6 by synovial and endothelial cells in joints affected in chronic inflammatory disease, including rheumatoid arthritis, may play a significant role in development of the inflammatory processes. The refiling of the sarilumab BLA to the FDA is expected during first-quarter 2017. This resubmission is subject to successful completion of an FDA inspection of Sanofi’s Le Trait fill and finish facility, with an expected action date in the second quarter. The European Medicines Agency accepted for review the marketing authorization application for sarilumab during July 2016 and a decision is expected in 2017. During September 2016, the marketing authorization application of SAR342434 (insulin lispro) was accepted for regulatory review in the European Union for the treatment of diabetes. The drive to become a leading biotechnology company concentrated on innovative approaches to treat rare and specialty diseases shapes the foundation of Shire’s R&D platform. The company’s expertise in discovering new therapies for rare, life-threatening genetic diseases as well as in developing medicines for patients treated by specialist physicians demonstrates Shire’s continued dedication to patients and their caregivers. Shire’s pipeline received significant boosts when the company completed its acquisition of Baxalta in June 2016 at a price tag of about $32 billion as well as through the purchase of Dyax, which was completed in January 2016 at a potential value of $6.5 billion. Shire has two subcutaneous projects undergoing Phase III studies: lanadelumab, which has been projected to become the top-selling hereditary angioedema drug in 2022 at $1.07 billion, and a subcutaneous version of the already-marketed product Cinryze. “Data with lanadelumab are due in the second quarter of 2017, which should give a clue whether it can live up to the lofty expectations,” according to analysis from Seeking Alpha. Also known as SHP643, the potential best-in-class drug lanadelumab came to Shire via the acquisition of Dyax. Lanadelumab is a subcutaneous anti-plasma kallikrein monoclonal antibody intended for prophylactic use. Shire is performing a single pivotal trial of SHP643 (formerly DX-2930) together with an open-label extension study for prophylaxis of hereditary angioedema with the goal of FDA approval during 2018. Shire has shown proof of concept for SHP643 in long-term prevention of hereditary angioedema without any significant safety concerns so far. The new product candidate has received orphan drug designation and breakthrough therapy designation from U.S. regulators. A new drug application is under FDA review for SHP465, a novel, long-acting, triple-bead, mixed amphetamine salts formulation. The new drug candidate is being assessed as a potential once-per-day treatment for attention-deficit/hyperactivity disorder. An FDA regulatory decision is expected by June 20, 2017, which is the designated Prescription Drug User Fee Act (PDUFA) action date. Shire refiled the new drug application for SHP465 in response to the FDA approvable letter that requested further clinical trials and classified the response as a Class 2 resubmission with a review goal of six months. Shire carried out two Phase III trials and one open-label Phase I study to support the refiling, all of which successfully met their primary and key secondary endpoints. For SHP621, the company is conducting a Phase III induction trial for eosinophilic esophagitis (EoE) and simultaneously enrolling a Phase III treatment extension study. Shire completed Phase II studies that met co-primary endpoints as well as an open-label extension trial. SHP621 was granted breakthrough therapy designation by FDA in May 2016 for treating EoE. The novel biologic SHP647 is intended as a treatment of inflammatory bowel disease and is the only anti-integrin directly targeting MAdCAM-1 with a potentially differentiated and improved safety profile compared to current treatments. Shire expected to initiate Phase III development of SHP647 during 2017. Shire is planning two Phase III trials with SHP620/maribavir for treating cytomegalovirus infection in transplant recipient patients. All clinical trials of maribavir have demonstrated an acceptable safety profile and potent antiviral activity including against strains of cytomegalovirus resistant or refractory to other anti-CMV agents. Adynovate [Antihemophilic Factor (Recombinant), PEGylated] received marketing approval from the Food and Drug Administration for new indications during December 2016. The new indications provide more hemophilia A patients with access to proven prophylaxis with a simple, twice-weekly dosing schedule. Adynovate gained marketing clearance as a treatment for hemophilia A in pediatric patients younger than 12 years. U.S. regulators additionally approved the product for use in surgical settings for adult and pediatric patients. Adynovate is built on the full-length Advate [Antihemophilic Factor (Recombinant)] molecule, a market-leading hemophilia A treatment with more than 13 years of real-world patient experience. Shire during December reported topline results from a Phase III study of Vonvendi [von Willebrand factor (Recombinant)] to treat bleeds in elective surgical settings for adults with severe von Willebrand disease, the most common inherited bleeding disorder. The product is an on-demand recombinant treatment for adults living with VWD and replaces von Willebrand factor. The results will form the basis of a supplemental new drug application to the FDA requesting an expanded indication for Vonvendi. Shire introduced Cuvitru [Immune Globulin Subcutaneous (Human), 20% Solution] to the U.S. marketplace in November as the first Subcutaneous 20% treatment option without proline to treat adult and pediatric patients (2 years of age and older) with primary immunodeficiency. FDA approved the product in September as a subcutaneous immune globulin (IG) replacement therapy for primary immunodeficiency, a group of more than 300 genetic disorders in which part of the body’s immune system is missing or functions improperly, in some cases making it more difficult to fend off infections. Shire is expand operations in Cambridge, Mass., establishing a rare disease innovation hub that will further catalyze the company’s serial innovation across a variety of rare diseases as well as highly specialized conditions.